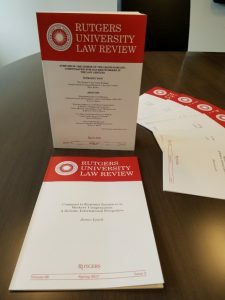 Commentary on workers compensation insurance by I.I.I Chief Actuary James Lynch is being published in the upcoming issue of the Rutgers University Law Review. Lynch’s piece, “Comment to Economic Incentives in Workers’ Compensation: A Holistic International Perspective,” was written in response to an article by Stanford Professor Alison Morantz and others. The two spoke at a 2015 conference about the Grand Bargain in workers compensation. In his response, Lynch noted that much of the current research in U.S. workers compensation “involves finding ways to reduce incentives that drive costs higher with no discernable benefit to the worker.” One example cited: When New York doctors book surgery for comp patients in New Jersey, they charge an average of $4,954, or 266 percent more than if the same surgery with the same surgeon took place in New York. (The I.I.I Blog featured this research two years ago. Neither Morantz’s nor Lynch’s article was online as of February 16, but both should become available at the law review website soon. During my 35- year + insurance career, I have reviewed hundreds of workers’ compensation claims – these include claims at several of the nation’s largest workers’ compensation writers (per the annual III Fact Book), the California and NY state funds, and numerous self-insured organizations – use of TPAs. From this hands-on experience, I noted where attorney involvement helped many injured employees, but in most of these claims, I had seen where the workers’ compensation system had simply become a lawyers’ compensation one. It is unfortunate, for reasons that cannot be listed in this response, that the ultimate no-fault system of workers’ compensation needs any attorney involvement.